Guillermo Del Toro is one of those nerds that I’m so happy to see make movies. Even in his weakest works like Crimson Peak, the man’s love for classic cinema shines in such a way that feels genuine and unforced. Further, the love is like that of an excited child telling you how awesome their favorite genre is and not, say like a pseudo-intellectual talking down to people unfamiliar with a genre and dissing people for not appreciating it enough…*unconvincing cough*La La Land*unconvincing cough*. So Del Toro once again graces our presence with a very simple idea: what if a chick fell in love and wanted to bone silly the Creature from the Black Lagoon? Shine on, you crazy Del Toro. So our protagonist in this bizarre erotica is Elisa Esposito (Sally Hawkins) a mute janitor working the night shift at the Occam Aerospace Research Center with her co-worker, Zelda (Octavia Spencer), while they both deal with the prejudices of 1960s America. While performing her cleaning duties, Elisa witnesses the US Government bring in their latest “asset,” a dangerous amphibious man (Doug Jones, no not that one) who can breathe underwater and has razor-sharp claws. While the lead scientist at the facility, Dr. Robert Hoffstetler (Michael Stuhlbarg) is fascinated with learning more about this strange creature; the guy who captured this specimen, Colonel Strickland (Michael Shannon), is hellbent on destroying it to pick apart its inside and move up the chain of command of the US military. And yet, Elisa is the only human that sees this creature as a person, and begins to fall in love with what she sees as a kindred spirit (and she wants to experience some curiously intense sexual gratification with a fish man). Therefore, she teams up with Zelda and her apartment mate Giles (Richard Jenkins) to see the amphibious man to freedom…and to Elisa’s bed. Yeah, there’s no way I can dance around the fact that Elisa is thirsty as hell for this thing that looks like Abe Sapien‘s backwoods cousin. Nonetheless, it’s pretty much the allure of this movie: that a woman falls in love and lust with this monstrous creature. But the film wisely becomes much more than that thanks to the strong characterizations brought by Sally Hawkins, Octavia Spencer, and Richard Jenkins’ characters. The trio are outcasts of society for one reason or another; be it there gender, race, handicap or sexuality. Together, they find this fellow outcast in the Amphibious Man as a kindred spirit, particularly with Elisa as she witnesses the abuse he suffers at the hands of Shannon’s Strickland. And it’s all the more impressive that you completely “get” Elisa, even though she doesn’t speak a word throughout this entire movie. This is mostly thanks to Sally Hawkins’ fantastic lead performance, which depends heavily on how expressive she can be with her face and entire body. These are the challenges that thespians live for, and Hawkins rises to meet it spectacularly. While much of her “dialogue” via sign language is displayed with subtitles, I think Del Toro could have pulled the whole affair off without providing this critical information. Hawkins’ various co-stars do an effective job of responding to Elisa, and save for one single scene that packed a hell of a punchline, you as an audience member could deduce exactly what she was saying. Hell, she shares many a great adorable moments with Richard Jenkins’ character that don’t involve dialogue at all, but bonding over classic films in a way that feels adorable and so wonderfully human. Plus, the lack of subtitles would have made her relationship with the Amphibious Man all the more heartwarming as you see these two bond in silence. Speaking of which, the make up job for this creature is a work of art. Scaly, wet, and slimy while also moving incredibly, it’s the best realization of the idea from The Creature from the Black Lagoon I’ve ever seen. 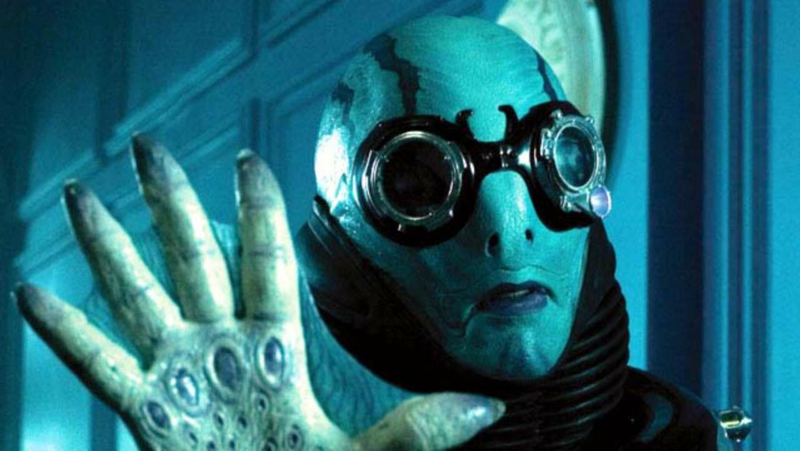 And Doug Jones, long-time collaborator with Del Toro, sells you on the identity of this creature by moving around in such an alien manner that he’s a joy to see on screen. Even the ways he becomes tender with Elisa is truly friggin’ fascinating because it never comes across as funny (despite how silly it looks) but it feels just damn sweet. This is mostly a credit to Del Toro’s writing and directing as the man truly displays his love of fairy tales for adults. Much like Pan’s Labyrinth, the man is committed to bringing the weird and fantastical and putting them in the context of anxieties facing adults. While some may bemoan the lack of subtlety, particularly where Shannon’s absurdly cartoonishly evil Strickland is concerned, I find it a pleasing aesthetic choice that helps the film both stand out on its own and feel distinctly like the product of a particular artist. But going back to Michael Shannon for a bit, I didn’t really have a problem with his over-the-top nature. Hell, I practically welcomed it because that’s what you hire Shannon to do: act friggin’ weird and scary as hell. He’s intimidating and he’s basically serves a convenient metaphor for the systemic oppression facing our various protagonists. I can’t say that a more nuanced performance would have worked better here, because it just wouldn’t have fit the mold of the fairy tale feel Del Toro was going for. But if you’re looking for more grounded performances, the rest of the cast has you covered. Octavia Spencer and Richard Jenkins both offer “realistic” takes on this fantastical situation, but they also are forced to reconcile their immediate negative reaction with Elisa’s childlike determination which leads to surprising character moments. Particularly with Jenkins, who is definitely taking my MVP award. His subplot is simply tragic to watch and he makes you feel what he’s going through despite the story line’s brevity with the rest of the film.